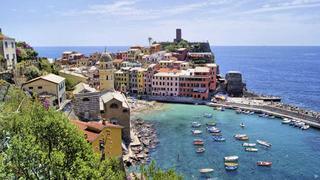 The Ligurian and Tuscan coast down to Elba is a wonderful destination for a luxury yacht charter in Italy. The tiny inlet at Portofino is one of the loveliest yachting ports in the world, and is on most charterers must-do list. Moving on to the historic city of Genoa, marinas at the heart of the old town allow you to stroll among unique shops and discover wonderful restaurants where you can sample traditional Ligurian dishes such as Trofie al Pesto. Further down the coast lies the stunning Cinque Terre, a UNESCO World Heritage Site, where five unspoilt villages cling to the cliffs and surround tiny coves along this beautiful coastline. The villages are linked by sea, rail and track, no cars can penetrate here. Over the ages, terraces have been worked into the hillsides, where grapes and olives are grown, producing local wines. Exploring the Cinque Terre is almost a trip back in time, to an Italy that Christopher Columbus (born in Genoa) would recognise. From Viareggio, it’s just a short drive to the famous city of Pisa. As well as the leaning tower, there are some excellent museums housing paintings and sculptures. Right in the centre of city is Europe’s oldest botanic gardens, Orto botanico di Pisa, laid out in the 1540s and is a beautiful and tranquil spot. The Island of Elba is perhaps best known as the site of Napoleon’s exile and subsequent escape, but this charming Tuscan Island has much more to offer. After Sicily and Sardinia this is the third largest island in Italy. Dominated by Mount Capanne at over 1000m, and home to wild boar and mouflon, the mountains look over a flatter interior. Ancient roads provide excellent hiking trails, and the submarine park of the Tuscan archipelago offers good dive sites. Ancient wrecks and shoals of colourful fish make diving and snorkelling a real pleasure.